Like many Americans, I love pumpkin pie. There is something incredibly soothing about the spicy taste, the smooth texture and the dollop of cream. 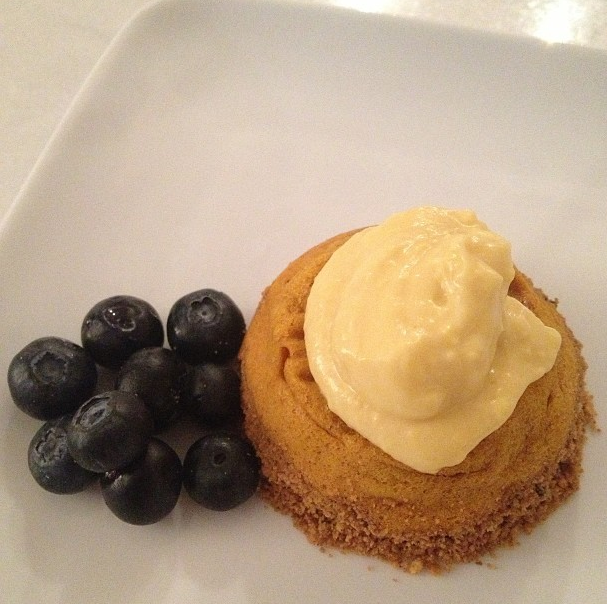 But there's also something about pumpkin cake or bread - the rich but dense texture with that pie-reminiscent taste. Here's a twist on both - why not put the two together? Even better, this one is lactose-free! Start with the vanilla cream since it will take at least an hour. In a bowl, whisk the yolks until smooth. Separately in a saucepan, mix the sugar and cornstarch over medium heat, add the soy milk in a slow, steady stream. Cook until it begins to bubble and thicken. Pour 1/3 of the mix into the eggs, whisk until smooth, then put the mix back into the saucepan and cook, stirring constantly, 3-5 more minutes until thick. Remove from heat and put into a ceramic bowl and chill covered for an hour. Preheat oven to 400°F. In a stainless steel bowl, beat the eggs then add the puree, brown sugar, spices, flour and baking powder and mix well. In a separate bowl, mix the crumbs, white sugar, cinnamon and butter until crumbly. Grease a cupcake pan with butter or cooking spray and line the bottoms with parchment. Spoon enough pumpkin mix into each cup to fill 2/3 of the way. Fill the remainder with graham mix but not quite to the top, then pat down gently with your fingers. Bake at 400°F for 15 minutes, then reduce temperature to 325°F for another 6 minutes. Remove from heat and cool. To remove, place the top of a cookie sheet down onto the open cups and flip over. Allow to cool completely. Note: a quick "cheat" for vanilla cream - prepare a box of sugar-free, dairy-free, no-cook vanilla pudding mix according to directions but use only 3/4 of the milk. Whip 2 egg whites in a bowl and once peaked, blend the two together.